In a large, deep skillet over medium-high, combine olive oil, garlic and onion. Saute until onion just begins to soften, about three to four minutes. Add plums and saute another two minutes. Arrange cod over onions and plums, then add enough water to come halfway up cod. 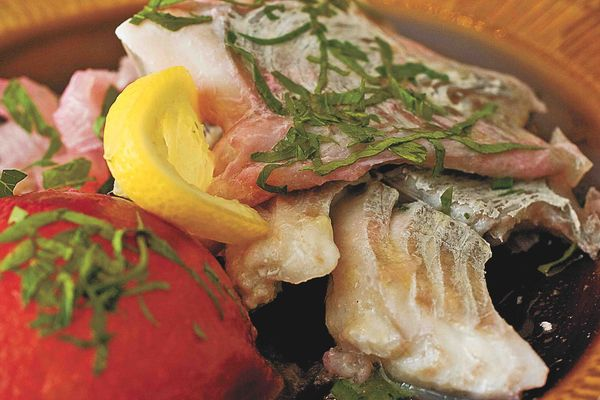 Sprinkle cod with salt, then bring water to a simmer, cover and cook 15 minutes, or until the cod flakes easily. Sprinkle lemon juice and parsley over cod, then season with pepper. This entry was posted in food, Mylopotamos and tagged Epifanios, recipes. Bookmark the permalink. A delicious meal ! I tried the recepie today and the combination with cod and plums worked out fine ! I had patotoes with the dish. Drink a Chardonay or even a slightly sweet wine, because of the tast of the plums. Do not eat the meal to warm, the plums get very hot ! Enjoy ! Regarding Father Epifanios – where can I purchase cookbook(s) by Father E? Here you can buy the Greek version of the book: http://www.perizitito.gr/product.php?productid=144472&page=2. 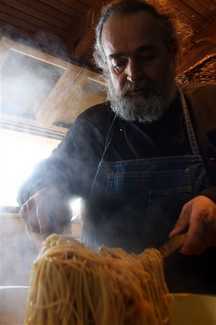 But if you take some time: the book “Cooking on Mount Athos” soon will be published in English and Russian (see the Kelliotis-blog: http://agioritikesmnimes.pblogs.gr/2010/07/649718.html). It is now available in English but it should be on Amazon.